Wyandotte County – Page 1606 – Welcome to Wyandotte Daily! More than 100 area choirs are scheduled to perform holiday music between Dec. 1 and Dec. 17 at Crown Center, 2450 Grand Blvd., Kansas City, Mo. For more information, see http://crowncenter.com/choirs. A Kansas City, Kan., student is one of several students who have roles in the fall commencement ceremonies Friday, Dec. 11, at Kansas State University, Manhattan. Stephen Kucera, from Kansas City, Kan., will perform the processional and recessional at commencement ceremonies for the Graduate School, College of Agriculture, College of Human Ecology, College of Business Administration and College of Education. He is a senior in applied music and accounting. Mild and dry conditions continue in today’s forecast, according to the National Weather Service. Other than a slight chance for rain on Sunday, expect similar weather for the rest of the week, the weather service said. Today’s high will be near 49, with a calm wind that becomes south southwest around 5 mph in the afternoon, according to the weather service. Tonight, expect mostly clear skies with a low of 31 and a light south wind, the weather service said. 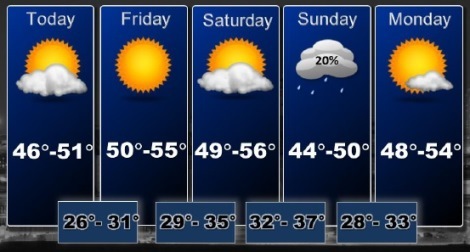 Friday, it will be sunny with a high near 54, according to the weather service. A light south southeast wind will increase to 5 to 10 mph in the morning. Friday night, it will be mostly clear, with a low of 34, the weather service said. A south wind will be 8 to 10 mph. On Saturday, expect mostly sunny skies, with a high of 53, the weather service said. A south wind of 8 to 14 mph will gust as high as 20 mph. Saturday night, it will be mostly cloudy with a low of 36, according to the weather service. Sunday, expect mostly sunny skies with a high near 49, the weather service said. Sunday night, the low will be around 32 with mostly clear skies, the weather service said. Monday’s forecast is mostly sunny, with a high near 53, according to the weather service. Monday night, it will be mostly clear with a low of 36, the weather service said.